From Chase to Grace: Prep Phase-Day 7: 40 B4 40 ~Are you a Faithful Fairy? Prep Phase-Day 7: 40 B4 40 ~Are you a Faithful Fairy? The first amazing thing is that I started reading the book Revolution by Y.P. Yohannan (Gospel for Asia) with hubby and it is just killing me of my selfishness, fast! In the first couple of chapters I read how this man from India surrendered his life to the Lord and shortly after, he had a similar anxiety attack about what on earth could he do for the billions of people on earth that needed a Savior. I had to cry and smile at the same time, boy, this was familiar! I can't wait to dive deeper into this life story of one who has given everything to get the gospel to the unreached people groups of Asia. His view of my American opulence is making me pretty sick, but in a good, gut-wrenching way. Heavy stuff and written from a perspective I've never heard. Thank you, Lord, for leading me to this book at this pivotal point in my life. The second thing that totally ties in with my heart this season is our new Faithful Fairies! and I thought, what a great thing to do! 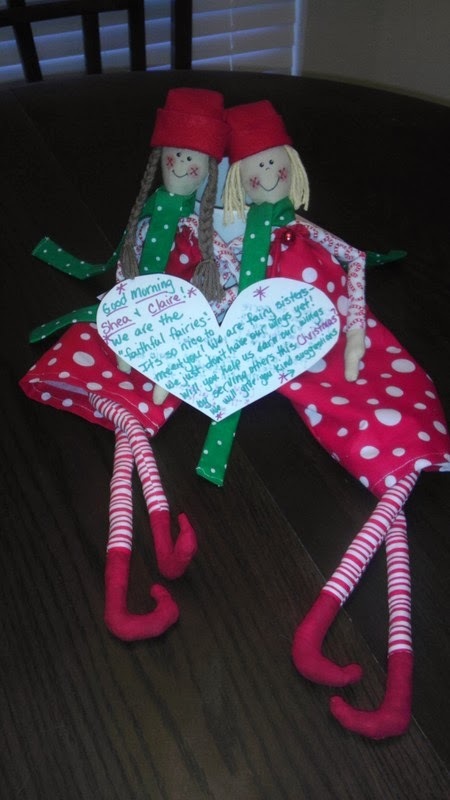 The elves are not mischievous, they are kind and loving! Another friend thought it was great, too, so she crafted these for us, I named ours 'Faithful Fairies' and she has 'Candycane Angels' for her girls. They all invite our children to do selfless acts each day until Christmas. It is a nice take on the Elf on the Shelf. Which really looks fun, but for the direction I'm going this season and since we don't do Santa, 'Faithful Fairies' seem a better fit for us. Good Morning Shea and Claire! We are the "faithful fairies". It's so nice to meet you! We are fairy sisters-we just don't have our wings yet! Will you help us earn our wings by serving others this Christmas? We will give you kind suggestions on how to serve and love others. It's up to you to follow through! How about today we begin our letters to Khushi and Muskhan? (Girls our girls ages that we sponsor through GFA). How fun! After much squealing, the girls came up with other things the Fairies could do this week with us. They are thrilled! Thank you so much for making these for us, Kris!!!!! I'm pretty pumped about all the fun ideas I have for these fairies! I'm thinking I will add a new bible verse to the daily suggestion from the fairies to help us focus on humility at Christmas. Any ideas for my Faithful Fairies? What does your family do to keep the gimme's out of Christmas? Have you read Revolution? If so, what is your take?